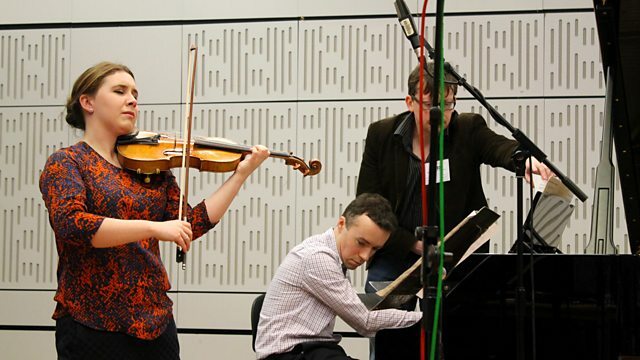 Sean Rafferty hosts live music and chat including violinist Chloe Hanslip playing live. Conductor: Andrea Marcon. Performer: La Cetra. Conductor: Harry Christophers. Performer: The Sixteen. Performer: Chloë Hanslip. Performer: Roderick Chadwick. Conductor: Oliver Simon. Performer: Ilona Domnich. Performer: Southbank Sinfonia. Performer: Daniel Behle. Performer: Oliver Schnyder Trio. Performer: Bella Hardy. Performer: Ben Seal. Performer: Berrak Dyer. Performer: Marcin Gesla. Singer: Tom Moss. Performer: Berrak Dyer. Performer: Eve Daniell. Performer: Berrak Dyer. Performer: Marcin Gesla. Music Arranger: Malcolm McLaren. Performer: Malcolm McLaren (1946). Performer: Giovanni Guglielmo. Performer: L' Arte Dell' Arco. Conductor: Howard Griffiths. Performer: NDR Philharmonie Hannover. Conductor: Edward Gardner. Performer: National Youth Chamber Orchestra of G.B.. Conductor: Rafael Payare. Performer: Ulster Orchestra.